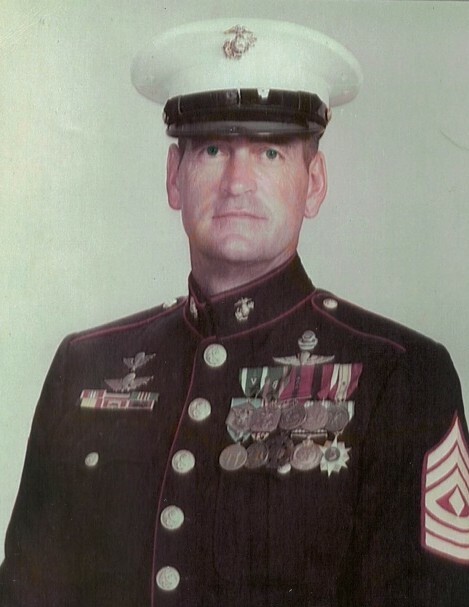 First Sergeant (RET) USMC David Paul Bilodeau, 86, of Manchester, New Hampshire passed away on February 11, 2019, in Myakka City, Florida. David Paul Bilodeau was born in Manchester, New Hampshire to the late Roger and Esther Bilodeau on September 5th, 1932. David started his military career in the 1950s joining the U.S Navy and served in the Korean War and later in the Vietnam War. After his enlistment in the Navy, he joined the United States Marine Corps in 1954, where he received high commendations including the Navy/Marine Corps Commendation and Achievement Medal with Bronze V (Valorous Service) and held the highest military clearance. Of the many courses that he attended during his 24-year career, his most notable were U.S. Army Ranger School, Jump Master Course (Army, Navy/Marine Corps, Vietnam, and Bolivian Airborne Wings), and The United States Navy Underwater Swimmers Course. He also graduated from Marine Security Guard School where he filled the billet as a commander of United States Marine Security at American embassies in La Paz, Bolivia, and Saigon, Vietnam, which included personal protection of ambassadors, dignitaries, and military personnel. Upon retiring out of the Marines in 1976 he served in the 2nd Reconnaissance Battalion (1970-1972) and retired with the 3rd Reconnaissance Battalion. David later pursued a career in law enforcement as a detective in Hollywood, Florida from which he also retired. He married the late Bettie Anne Bilodeau on June 20th, 1992 in Franklin, North Carolina. He is survived by stepchildren that he called his own, Charles Duane Edwards (Susan) of Bradenton, FL; Stephanie Anne Roberts of Boone, NC; Elizabeth Grace Virginia Rice of Knoxville, TN; and Nicole Ruth Blizzard (Dennis Jay) of Myakka City, FL; along with 11 grandchildren and 12 great-grandchildren. He is also survived by sister Virginia Parsons (Theodore), nieces Kathy Cote (Donald), Pamela Anderson (Patrick) and Keri Hilyer (C. David), as well as nephew Timothy Parsons (Christine). Celebration of Life will be held Thursday, February 28th, 2019 at Griffith-Cline Funeral Home, 720 Manatee Ave. W., Bradenton, Florida. Visitation will be at 9:30 and service will start at 10:30. Full military honors will be held at 2:00 p.m. at the Sarasota National Cemetery, 9810 SR 72, Sarasota, Florida. Arrangements may be sent to Griffith-Cline Funeral Home.